What I want is, based on the above params, create a big table with the number of rows defined by the sum of "n" column. Basically the "n" column should indicate the number of rows for that particular term, and then go to the next one. First, this gets the first sheet of the spreadsheet. Then, it assumes the "terms" are the first column of this sheet and the "n" column is the second column (and both have a header row). It then iterates over the rows of the first sheet and for each "term", it appends "n" rows to the second sheet of the spreadsheet. Expanding a column of integers into a column of ranges from 1 to each of the integers? How to count the number of empty rows since the last entry in a column? 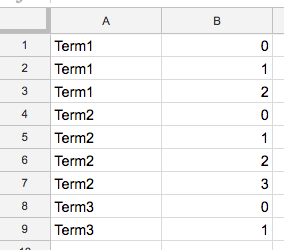 Is there a way to autofill cells with a formula targeting cells horizontally (in rows) while autofilling vertically (in columns)?